Whenever you buy a product from a company, you’re almost always dealing with a for-profit entity that exists to make as much money for their owners and/or shareholders as possible. For most companies, that means maximizing the amount of profit that they make on each item sold. So, let’s say you bought a product nine months ago. It’s under warranty (you think), but you can’t find a copy of the receipt or a copy of the warranty. You call up the company anyway and try to get your issue resolved. Unless that company is going far beyond what one might expect from customer service, you’re not getting anything. Most companies will just politely tell you “no” on their customer service line and no matter how much you escalate the call, you won’t get anything. 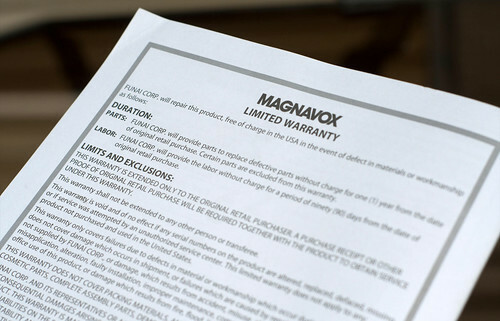 If you ever expect to utilize your warranty, you need to have documentation proving that your warranty is valid. Without it, the company has no reason to honor it. Of course, as I noted above, there are a few companies that will still work with you, but these are generally companies that pride themselves on customer service and often are charging a premium price for their products in the store. They operate on a somewhat different business model than most companies. Don’t expect that. Protect yourself. So, how do you handle this effectively? My approach for handling receipts and warranties is pretty straightforward. I simply have a drawer in our filing cabinet that’s about half-full of warranties and receipts. I put the needed information for each product in an envelope. On the outside of each envelope, I indicate what the product actually is and simply add it to the drawer. I also write the date that the warranty expires. These two pieces of information help greatly when it comes to filing these items and finding them. I use the name of the item (starting with the company name) to sort them in the drawer. I use the date on the envelope to determine when envelopes can safely be shredded and tossed. What about warranties that require you to send in a receipt? Send in a copy of your receipt. Keep the original for your own records. That way, you have proof of the purchase in your hand. Most of the time, the warranty will expire without you even noticing, which is a good thing because it means the product worked fine. However, getting into the routine of keeping your warranties and receipts straight will pay enormous dividends for you when a product fails. You know where the receipt and warranty are, so you just go retrieve them and follow the directions.